Live, from Peoria, it’s Saturday Night Cheeseburger! The host this week is Jim’s Steakhouse and featuring the Ready For Prime Beef Player, Marty Wombacher! Ladies and gentlemen, please welcome, all the way from downtown Peoria, Jim’s Steakhouse! Here we are in the heart of beautiful, downtown Peoria, a couple of blocks from Jim's Steakhouse. This is the place, Jim's Steakhouse, a Peoria fine dining institution! Obligatory gold elevator mirror shot! And here we are at the doorway to Jim's. Looks nice and festive in there, let's go check it out. 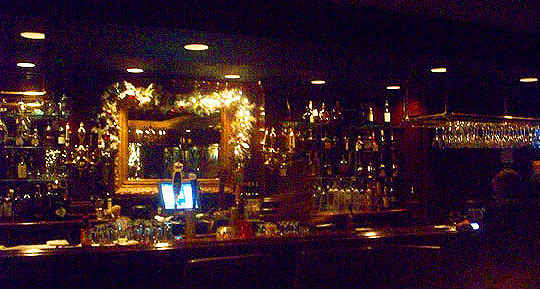 And it's one nice, highly-polished bar. It's good and dark in here, definitely an Al bar! Here's friendly and pretty bartender, Karen, serving me up an appetizer for the meal! And here's another pretty face doing duty behind the bar, Mary, who's flashing the MBIP business card. Bonnie and Steve were seated down the bar from me and were a friendly and nice couple. Steve had watched a game on TV and told Tim Comfort, the owner that Jim's was one hell of a sports bar. Smelling salts were quickly dispatched for Mr. Comfort! A shot of the taps for Spike! In addition to the main dining room, there's tables behind the bar to sit and dine at. 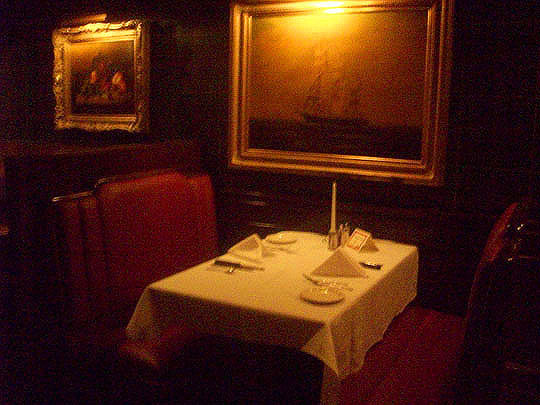 There's also cozy booths for a romantic candle-lit dinner for two. Time to order my dinner. After perusing the menu, I was afraid I was going to have to improvise and maybe go elsewhere, because I didn't see a cheeseburger on the dinner menu. I told Karen about my cheeseburger dilemma, and she went and talked to the chef and he said he'd prepare me one off the menu! This is one friendly place! The icing on the cake in here is that they have live piano entertainment in the bar! It made me think of Bill's Gay Nineties in New York! The chicks really dig this guy, I'm going to get closer and try to move in on some of his action! The piano man is Gene Farris and he's a great singer and musician! He's been entertaining in and outside of Peoria for over 50 years! Take that Billy Joel! Gene's available for parties and corporate events. If you need an entertaining and fun piano man for a party or event, send me an email and I'll let you know how to contact Gene. While we're on a musical note, check out the guitar on the wall. It was donated by hometown boy made good, Dan Fogelberg. Dan also autographed a photo for Jim's. Elton John ate here last year after tickling the ivories at the Peoria Civic Center. Look, it's Ken Berry, can you say dinner theater? I knew that you could! Hey, speaking of dinner, let's go back to the bar and see what's happening! The table is set and looks like dinner will be happening soon! Well, if ever there was an appropriate time to say: "Holy cow," now would be the time. Holy freaking cow, look at that cheeseburger! 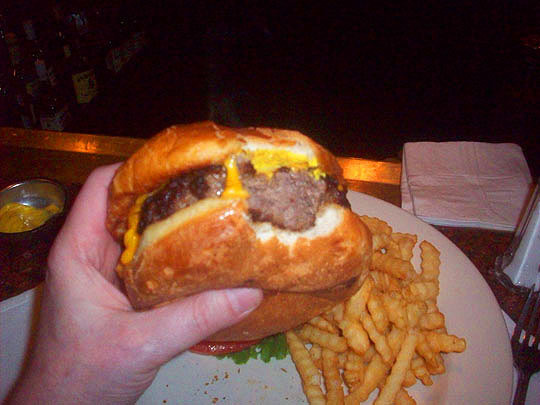 The cheeseburger is so big it was hard to get a one-handed shot, but I managed to pull it off. Burp! That was one delicious cheeseburger! Thanks to the chef and the staff of Jim's for making the cheeseburger off the menu for me! And speaking of the staff, some of them posed for a portrait as I was leaving. Clockwise from left: Danielle, Ashley, Karen, owner Tim Comfort and Mary! Jim's is a great restaurant and filled with friendly and fun people. Thanks for a great Saturday Night Cheeseburger! Jim’s Steakhouse has been a popular Peoria restaurant for over 50 years. They’ve been in this downtown location for over 21 years and the place pretty much defines fine dining in downtown Peoria. The dinner menu doesn’t feature a cheeseburger, but the kind folks at Jim’s are more than accomadating and when I told them about my Saturday Night Cheeseburger outings, they were more than happy to make me one off the menu. And it was not only off the menu, it was off the charts! The burger was over a half a pound and made with aged ground sirloin, topped with tangy sharp cheddar cheese and served on a bakery fresh bun. The aged ground sirloin gave it a nice juicy steak flavor and it was one of the best cheeseburgers I’ve ever had. It came with a heaping mound of crispy french fries and made for one delicious Saturday Night Cheeseburger evening. Cheeseburgers are available at lunch and if you stop by for dinner you may want to try one of their many steak selections. It is a steakhouse after all! There’s twenty different styles of steak to choose from including: Rib Eye on the Bone, Beef and Blue (Filet Mignon with Blue Cheese), Cajun Rib Eye and Chateaubriand Bouquetiere For Two. There are non-steak items on the menu too, such as: Chicken Marsala, Alaskan Halibut with Blue Cheese Butter, Spaghetti with Meat Sauce and Alaskan King Crab Legs. Four Wimpy’s, a great burger, made off the dinner menu with aged ground sirloin. Delicious! Further Reading: CI News Now, Peoria Restaurants and Peoria Night Out.